The OATH compliant, time-based One-Time Password (OTP) FortiToken 200 is part of Fortinet's broad and flexible two-factor authentication offering; it is a small, keychain-sized device that offers real mobility and flexibility for the end-user. There is no client software to install; simply press the button and the FortiToken 200 generates and displays a secure one-time password every 60 seconds to verify user identity for access to critical networks and applications. The big LCD screen of the rugged FortiToken 200 is much easier to read than other OTP tokens and there is an indicator on the screen displaying the time left until the next OTP generation. 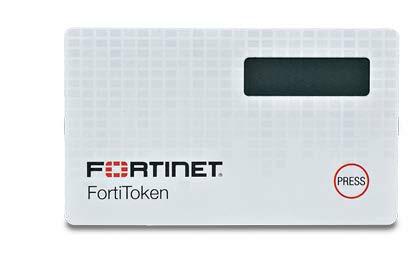 FortiToken 200CD tokens are shipped with an encrypted activation CD for the ultimate in OTP token seed security.FortiToken 200/200CD The OATH compliant, time-based One-Time Password (OTP) FortiToken 200 is part of Fortinet's broad and flexible two-factor authentication offering; it is a small, keychain-sized device that offers real mobility and flexibility for the end-user. There is no client software to install; simply press the button and the FortiToken 200 generates and displays a secure one-time password every 60 seconds to verify user identity for access to critical networks and applications. The big LCD screen of the rugged FortiToken 200 is much easier to read than other OTP tokens and there is an indicator on the screen displaying the time left until the next OTP generation. FortiToken 200CD tokens are shipped with an encrypted activation CD for the ultimate in OTP token seed security. Download the Fortinet FortiToken Datasheet (PDF).